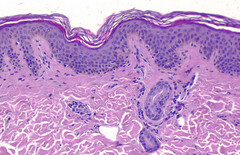 The human skin is a complex organ composed of multiple cell types. Interaction of these cells maintains the homeostasis of the tissue and disruption of the cells’ interaction might lead to the development of skin diseases. For the better characterization of the interplay between different cell types of the skin, the main cell types from the healthy skin will be isolated and purified. RNA of the cells will be extracted for the subsequent analysis with the Affymetrix Gen-Chip system to define all the genes expressed in the cells at the given time point. The main goal of the project is to present the abundance of data, generated by transcriptome analysis in a simple and distinct manner. Therefore the students should develop a computer program, which is able to link the transcriptome data and a vector graphic of the human skin. In order to evaluate the user-friendliness of the software, it is planned to perform a survey of students at the Medical University of Vienna. That would allow to identify possible weaknesses of the software and to correct them in the end of the project. During the project students will get to know new areas of bioinformatics in the fields of health and sciences, which are otherwise not or only partly covered at school. Furthermore, this project provides important insights into professional practice and work in a scientific laboratory. Besides, students will get an overview of bioinformatics, which is not highlighted in school, but however, could be important for their future studies or profession. This project will be an exciting technical challenge for students, which could be further processed in their diploma thesis projects.